This is a sponsored post, all opinions are genuinely my own. This is the fourth year I have participated in this fun campaign! After some thought, and looking at the inspiration on treatsfortoys.ca, we decided to make a bunny. We prepared the original recipe for Rice Krispies treats and sprinkled chocolate flavoured sprinkles on the mixture after it was flattened into a 9x9 pan. After it cooled for two hours, cut four 1×3 rectangles for arms and legs. A 3x3 square for the body, two triangles for ears, and a circle for the head. Decorate with candy using icing as the glue and snap a photo before the treat disappears. 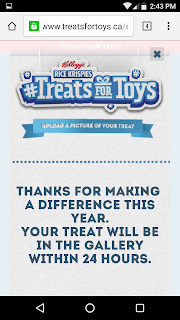 You are invited to visit www.TreatsforToys.ca for more information on this festive campaign and to upload your own creation to help a child in need. 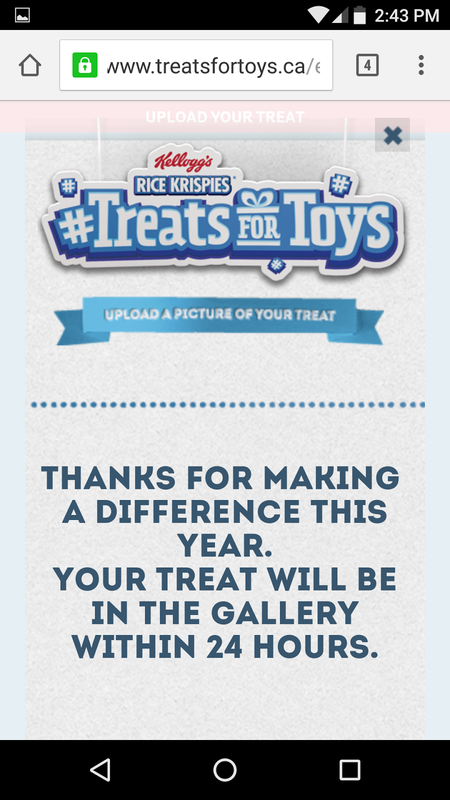 "To ensure no child goes without the magic of the holidays, the Kellogg’s Rice Krispies #TreatsForToys program has once again partnered with The Salvation Army to encourage Canadians across the country to create a toy-shaped Rice Krispies treat and share a photo on TreatsforToys.ca, Facebook, Twitter or Instagram using the hashtag #TreatsforToys. For every photo uploaded or shared on social, Kellogg’s Rice Krispies will donate $20 to The Salvation Army for the purchase of an actual toy for a child in need during the festive season. Make. Share. Give. These three simple steps will help create magical memories for children to cherish for a lifetime." I would like to try the Special K* Almonds & Peanuts bars. I know my son and I would just love to make the robot!! Thanks. Happy Holidays! I will make Yummy the Bunny! 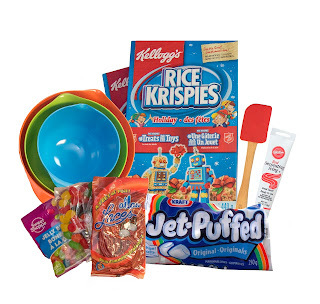 I would create a robot out of Rice Krispies. I would love to make robots with the kids. I would make a toy train. I would try to make a snowman. I would make a snowman. We'll make one of the trains - Thomas is a pretty big feature of our house, and all things 'train' are a hit. I'll be making a robot, & the kids want to make penguins. I would love to make the train ! We would like to make yummy the bunny. My kids would enjoy it. 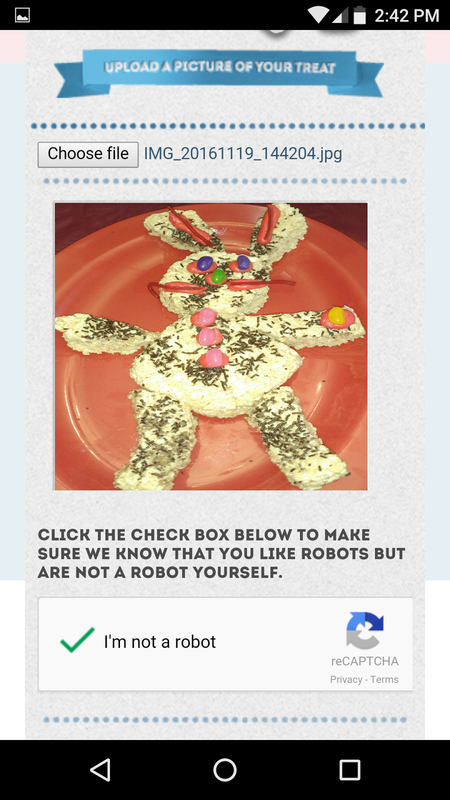 I would like to make robots with the kids. I would love to create a doll or a car. My son wants to make the T-Rex. My daughter wants to make christmas ornaments to put out on the snack try for our Xmas party. 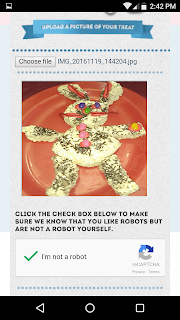 I would like to make Yummy the bunny.I love rice krispies as much as the kids do! I would like to try the Special K Popcorn Chips. I would make a minion with my kids.